Somebody must be reading this (actually 60 people a day) since this GREAT question came in. Q. My listing agent is taking commission plus a $395 administrative fee. What is the administrative fee all about? Great question! Why didn’t I think of that? Shameless plug: FranklyRealty.com has never charged an Administrative fee. I just never understood what it was. It is a junk fee, but allowed if you agree to it. What is an administrative fee? It is a fee that is supposed to cover “the cost of paper and tools, etc.” Um, but don’t they also get a BIG chunk of the commission too? Yes, so it is a fluff fee to increase revenue. A fee that is easy to slip past the client that might not know better, so why not charge it? Thank God you have this Blog to get the inside scoop. How do they get away with this fee 70% of the time? While everyone knows there is competition for which agent you pick, there is another round of competition that you might not know about. It is the competition amongst brokerage firms to get the top producing agents to work for them. Different firms have different split structures. Some start with 50% going to the firm and 50% going to the agent (and they need an admin on top of that, give me a break!). And this 50/50 split is for deals that the agent finds on their own! It drops even more if the firm gave them the deals. And it cuts in HALF for the first couple of deals since a mentor gets a portion. Yes, a new agent can get as low as 20% of the commission, I saw it in real life. A friend/new Realtor walked out with a $2,100 check on a $10,000 commission that she brought to the firm. And you all thought we had it easy!! So one way firms lure agents in is with more competitive splits. Some firms recruit newbies at 50% splits, and some take experienced agents and only charge 5%, plus “desk fees.” But wait. They have to make money somehow. So many firms started with “admin” fees to subsidize the brokers (because the agents wanted higher splits) and now they also do it with ABA’s (see Blog: “Affiliated Business” or Illegal Kickbacks?) So one could say that the brokerages didn’t need to charge that if the agent split was lower and more profitable. So while the agent pitches it as “oh the broker charges that, I can’t do anything about it,” they in the meantime are charged less by the broker. So indirectly that admin fee goes to the agent, in the form of lower fees to them. Have I confused you yet? Agent: Dear Broker, I need a better split. Broker: But I’m not making enough money at this rate. Agent: Do better or I will leave. Broker: Hold on, I’ll give you a better split but you will have to pass on a $395 fee to your clients that would go directly to us. Agent: Deal! Where do I sign? Agent to Client: Oh, that Admin fee is for the broker to cover costs of doing business. How common is the Admin Fee and where should I look for it? I spoke to 2 closing companies. Both agreed that the range was from $195 to $395 and they were on 70% of closings, and they were on both the listing side AND the buying side. I had never seen them on the buying agent side, news to me. Heck, maybe I should start charging this! Net everything out. If your listing agent is charging x% plus $395, add it up. And question it to see their recorded pitch. If you never signed anything allowing that fee, make the agent eat it. This is like a lender giving you a good faith estimate and suddenly adding an admin fee. It is up to you if you wish to ask for the fee to be waived if it WAS disclosed. I go back and forth on the ethics behind this since you DID agree to it. But maybe you were tricked into it? One closing company told me that 10% of agents eat this fee since some are embarrassed by the fee and sometimes because a customer won’t pay it. Pick a firm that doesn’t nickel and dime you. If they are pulling this fast one on you, what else are they pulling? I even know of one company that lets the REALTOR charge whatever “Admin fee” they want and the Realtor is allowed to take that fee themselves! Yes, they blame it on the broker, but then they pocket it. I’m so glad you did a blog on this. I think those admin fees are a sham and would never work with a firm that charges them. From a buyer or sellers point of view, their agent is being paid in the form of a commission. How much of that is going to the broker vs. the agent is not the client’s problem. Our job as agents is to represent our client and get them the best deal possible. To turn around and try to charge them an additional junk fee is NOT looking out for their best interest! [I work for Remax] Each Remax office is independently owned and operated so each individual Broker/Owner decides whether to charge one or not. Mine doesn’t. The way I see it, any Broker is going to make their money one way or another, either by taking a percentage or charging a monthly fee or whatever. I get that they’re running a business and need to make money. But no one is going to dictate to me what I charge my clients. Especially a junk fee that makes me look like a total sleaze. I thought that firm always charged admin fees. Good to know that is not the case. Frank: You picked another great topic. As a title agent we now have to be really careful with commission statements. Normally having one statement from each office was sufficient – listing and selling, if co-brokered. We had a closing two months ago where the listing agent and buyer agent worked for the same office and each were charging an additional fee but disclosed it on separate commission statements. Our HUD preparer only picked up one thinking the other sheet was redundant. I ended up eating a $250 fee because we missed it. I am a free market person and so I don’t begrudge anybody the right to pick up any legal fee. I DO have a problem with the practice when you consider it in the big picture of ABAs and kickbacks and the pressure for title agents and lenders to eat fees to make a deal work. This is part of the mob-like environment that has developed. I think individually, transaction per transaction, an agent or broker may justify additional fees and, “frankly”, who cares as long as the customer was given a chance to shop for services and decided to deal with this company. I use to work with a realtor who charges $900 to the buyer and/or seller he’s representing. He claimed it was to pay for his assistants. It made me sick. We no longer work together. At the time, he was the only realtor I’ve seen do this. I’m not sure if this is happening more now in the Seattle area or not? I’m so glad I found this blog. I am closing on my new home on Friday and was told about admin fees of $295 the Monday before my closing. I did make the agent eat the fee. It feels good to make the realtor accountable for their actions. Private mortgage insurance doesn’t seem so crooked any more. Make sure you sign up for the blog, as each post is designed to save somebody a few hundred or thousand dollars. ALso if that agent didn’t disclose those fees up front, you can report them. Email me directly to find out how. I closed on a home yesterday and the agent called back today to tell me that the closing attorney forgot to put in an administrative fee of $195.00. She did say that her broker was charging her for that fee and not me. The realtor Crye-Leike places this fee in te contract with other wording so that it blends into the contract and is not conspicious. This fee is outrageous and needs to be outlawed especially since the broker and the agent make so much money from the sale. My buyer’s agent disclosed a $395 admin fee to us and explained that it was to pay the broker for the use of his facility. I had a perplexed and frowned look on my face when he told us this, and he quickly offered to pay for it out of his own pocket. It still left a bad taste in my mouth and he made it seem like we were taking money out of his pocket. Not a great way to start a relationship with a realtor. My agent at Baird & Warner said they would recommend me to another firm if I was adamant against the fee. That’s just sad. I understand the brokers ae suffering financially, but I might as well hire a secretary to do the work to sell it FSBO (showings/placing ads etc.). It seems that admin fees will only leave them with the properties people are desperate to sell and further depreciate the marketplace. Here is a buyer agent fee. Meanwhile they are giving a rebate. I thought that was pretty funny. – $1.8 Million dollar purchase… Buyer agent $295 admin fee. – $450k Alexandria. Listing agent plus $210 admin fee. – $525k falls church. Buyer Agent no Admin fee. So of the 18 deals about I found 3 that did not charge admin fees. Keep in mind, we never charge them, so the info about is when the other side charges them. I gotta say I love the website as well as all of your incredibly helpful insight. As a DIY person, it really helps to be able to talk with and learn from those with experience. I was going line for line through our “Good Faith” (LOL) Estimate. Some of it was in accordance, but there were/are a few junk fees. Blogs like yours help people like me separate the good from the bad. I listed my townhome for selling with B&W. No luck. I completed the contract and took the property off the market. They now send me a bill for 295.00 for admin fees. Is this legal? The contract does state that we have to pay if we seel but does not explicitly mention that we have to pay that no matter what. Whats your opinion ? Great question. Depends what the exact contract says. Ask them to show you where it says that they are owed a fee. Love your blog, as an attorney new to the area and looking at homes with a realtor, you’ve been informative and helpful. My buying agent gave me a contract with this fee in it, and said it was charged by the broker due to “increased expenses.” Well, being a numbers guy, I put together a chart for him showing the relative growth in home prices (and therefore commissions) in the DC area vs. the regional inflation in the DC area. BLS puts out a DC area inflation, and Case-Schiller puts out a regional home price index. And guess what? Home prices (even after the “bubble burst”) have increased by over 100% since 1997. At the same time, inflation has eroded the value of currency by about 41%. So, while general expenses grew by around inflation (41%), gross commission is growing at 100%+ Something seems fishy. Thanks for clarifying that this growth is due to competition among brokers for agents. Good luck with law school, but if you thought the real estate broker/agent market was tough, I’ve never seen a job market so cut-throat for attorneys. First pff any Real Estate Company has to generate enough mony to pay the bills. the eyes of our clients get a little wide open when we talk about that fee and really the level of trust goes down. I think it’s getting absurd, especially when they do these fees for buyers now too! I’ve seen them as high as $500! I think it’s really just people in the industry trying to take advantage of unsuspecting customers who get overwhelmed by the entire process, but specifically the HUD statement with all its fees that usually aren’t explained very well. Great blog post on this topic! BTW, I just paid a $375 admin fee to Long and Foster (didn’t they invent this junk fee) as a buyer of a Fannie Mae HomePath foreclosure. Note that this agent and the listing agent worked in the same office and this was the only property my agent showed me (after I found it). News flash – The title company that did the settlement refunded this amount to me a month later after the closing since apparently this fee is NOT allowed for Fannie foreclosure sales. Frank – we saved $425 (admin fee) by following your advise. When we first met an agent, she had us signed the $425 admin fee disclosure (Keller Williams agency in MD). We reluctantly signed it (agent advised that every broker in the state has implemented the fee to cover admin expenses) but looked it up online later that day. Thanks to your blog, I found out that it’s just another junk fee that’s being passed on to the client. I fought back and the agent eliminated the fee (after 3 days worth of exchanging emails). Thanks for educating!!! Thanks for this you just saved me $295. 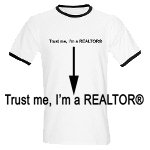 A re agent in florida is telling me I must pay a “keller williams administration fee” or she won’t close the deal, plus take it off the market. It’s a short sale. I haven’t contacted her yet. she said re law requires it. I think it’s looking for more money, but I would not like to lose this deal. suggestions? steve. I’d like to chime in regarding what Steve posted above. I’m a first-time buyer and was told by my prospective agent that the only way I’d see any properties is to sign an agreement and that all agencies share similar fees. This was also a Keller Williams office. Now I’m subject to a $395 fee to make an offer PLUS $250 “administrative fees” at closing and the buyer’s agent will make commission on top of that. I questioned what the $395 was for, and the agent said it was split between himself, his group, and KW. No explanation of what the fee was for, just who it goes to. Also seeking suggestions, though I’m corroborating Steve’s story too. I doubt the FLA agent said it is required by law. Ask for her and her broker to put that in writing. Perhaps she is referring to laws that require you to perform as per a contract you have signed. The fee is bogus, and there have been class action suits on this topic. The new way around it is the firm charging a 2nd commission, or a higher total commission and not calling it Admin Fee since that might be a RESPA violation. B. in Midwest, for them to say that all companies charge that fee, is also bogus. Get them to put that in writing. Do it by emailing them, “as per our conversation, I signed this document based on your statement that all companies charge this fee, you still stand by that right.” If they reply, then show the broker and ask if they agree with this statement. They will not and you might be able to claim you signed based on incorrect information. B. if you haven’t signed yet… get another agent. I had a realtor show me three homes over a period of several months. All three had problems but were all “great fits” for me according to the realtor. One in particular was a short sale that was listed for $290K. I went to look at it and the realtor said if I was interested I needed to give her a check for $5,000 by 9:00 am the following day and give her the name of the attorney I would be using. She said the house was a great value at the asking price. I went home that night and after doing some research decided she was crazy. Not only did the realtor say it was a great value but she also suggested I included an escalation clause up to $300K. I decided the house was not a deal and did not pursue it. The next day it was reduced to $275K. If I had gone ahead and made an offer I would have paid $15K more than what the asking price was only a few hours later. And this was a good value? That was close to two months ago and the house is still for sale. About two weeks ago I saw a house online and contacted the same agent to set up a viewing. She did and this time I liked the house. After a few days I decided to make an offer and the two of us got together Sunday evening (three nights ago) so I could sign everything. I had received the sales contract ahead of time and found some major mistakes. The biggest problem was many of the items listed in the seller’s disclosure as being included were not included in the sales contract. My agent said that didn’t matter because the buyer’s disclosure is what would take precedence. The sales contract stated if there are any differences between the two the contract will be followed. I had her add all items that were not included. To make a long story short, everything was finally corrected and signed and it looked like things were moving forward. The next day she contacted me and mentioned she had overlooked a few things in some of the documents I had signed and asked me if I could make the corrections. That is her job but I went ahead and did it. Then I submitted the revised forms to her and the listing agent. It looked like I was just going to have to sit back and see what happens (this is also a short sale and my bid has been submitted to Wells Fargo) when I got another email form her last night stating “Sorry, I have one more form for you to sign that I have attached and there is another that I will have to send tomorrow.” I said I would look it over when I got to work the next morning and then submit it. This morning I looked at the form and it is an Exclusive Right to Represent Buyer Agreement that is backdated to match the forms I signed Sunday evening. The form states I have to pay $295 if I buy any home through her between 1/13 to 3/29/13. This fee was NEVER mentioned previously AND the agreement is backdated. Should I sign it? I would not sign a backdated contract. We are also trying to be charged a $395 “junk fee” by our Keller Williams Realtor, Crystal Porter in Albuquerque, NM. There were no explanations to us or discussion that be were being charged this fee. Beware of Keller Williams and their agents. It has been a nightmare working with her, and I say “working with her” very lightly because she basically did nothing. I am honestly not sure what all of the other companies are doing with their admin fees, BUT admins for many companies are bonused on top of their income based on how many successful closings they handle. Their bonus is based off of the admin fee income. I know that if a client doesn’t want to pay the admin fee (which is always optional) I am less likely to pick up their phone call than I am someone who pays the fee. If you don’t pay the fee you don’t pay for the extra service you would have otherwise received. Believe me, when you as a client are DESPERATE for an answer to an important question and you can’t reach your agent, his assistant is your lifeline. I have over 10 years of real estate admin and real estate experience and I am licensed. I know the contract and procedures better than most agents. If you don’t want to pay for that safety net, that’s up to you, but it’s not a bogus commission that the agent is eating where I come from. It’s feeding my family. As a title agent, I’ve had realtors try to get the seller to pay for this cost. I tell them that it is not a closing cost, therefore it is not covered by what the seller agreed to pay per the contract. Then she tried to get me to call it a “commission” and charge it to the seller since the seller pays the commission. I said I can call it that, but I will still charge it to the buyer because the seller, per the contract, agreed to pay 3% commission. One penny extra is over 3% and it goes on the buyer’s side. Finally the realtor got mad at me and yelled at me in front of her clients as if I was the bad guy because I dared to charge HER fee that SHE told me to charge. I tell everyone I know – REFUSE TO PAY THE FEE UPFRONT. There are plenty of real estate agents that DO NOT charge the fee. It’s a bogus, phony, fee. Thank you for this blog. We are about to close on a house tomorrow and we got the closing papers today from our attorney. A few minutes later, we got revised papers saying they had forgotten to add our realtor’s “HUD fee” of $195. We purchase investment properties and had never paid such a fee. I looked on our first offer and no fee was listed. I looked on our second offer and the agent (we used the sellers’ agent so she would have more of a desire to get the deal done) and on the second offer, she changed the contract to include this junk fee. How deceitful is that! Unfortunately, we “ASSuMEd” that the 2 contracts would be the same exact except for the price, but they added this fee. My husband is planning on having a “meeting of the minds” with the agent first thing in the morning. Frank, have you ever heard of an initial contract verbage being different from the counter-offer, with the exception of purchase price, of course? Just got back from the closing. Called the agent on it and she immediately backed down from it and said she would pay it. Everyone should call the agents on this, as we were the buyers and shouldn’t pay anyone a “Commission Fee” to purchase a house. ….. Just another profit center. What does this paragraph mean? Does it mean, even if we don’t buy the property due to the inspection contingency, we are still paying the “buyer’s agent” a fee? Not sure, would need more context to answer. I see most of this is pretty old but most of what I read is nonsense too. The broker charges the fee. Not the agent. The agent gets 0 of that. Most of the time I pay that fee for my client simply because I cannot explain it to them in a way that makes sense since they are paying a commission for selling their home or helping them to buy a home. Why should they pay that fee? I do not know. Why do agents have to pay the house in excess of $22,000 a year to do business? I don’t know. Why do agents have to pay a monthly MLS fee, monthly office fee and $600 + in annual dues to the local AR? Why do they have to pay an annual fee for any creditations they receive? That would be any thing after their name such as Green, ABR, ASR etc… I don’t know? How about the $500 a year for CON ED? I get that one. How about the marketing, gas and time spent showing and trying to sell a home? @Fred, You asked many “why’s” but somewhere in your mind, you already have the answer. Sounds like agts got the squeeze from all sides. They be gettin’ juiced from the system big time. After reading this site I actully feel sorry for the agents that get caught up in that spidersweb. CAN agents claim all of the costs that you mentioned on they tax statements? maybe somone start a charity for agents that be all starvin holding on to fruitless dream. Fred— After adding up all your license fees, MLS fees, CE fees, (etc.) and the costs can add up quick…. I get it. BUT you get something of value for all those things you mentioned. The client who gets slapped with an extra admin fee receives nothing of value, nothing.